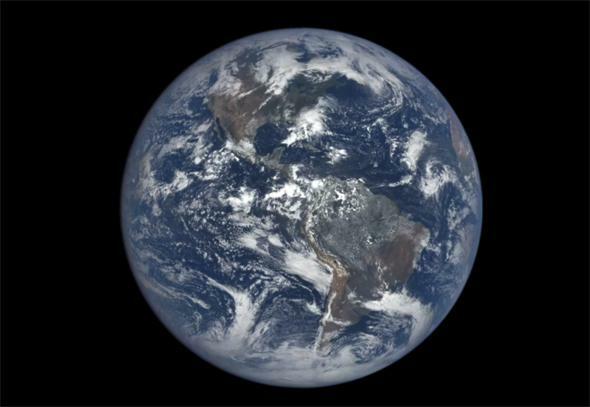 EPIC time-lapse animation of the Earth spinning over a single year. NASA has released a pretty amazing video: It consists of more than 3,000 images of Earth taken by the Earth Polychromatic Imaging Camera (EPIC) on the DSCOVR spacecraft. DSCOVR is in a special orbit, 1.5 million kilometers closer to the Sun than Earth, that keeps it more or less between the Earth and Sun. It faces us, so it always sees the daylit side of Earth, and takes an image every two hours, watching the Earth rotate. The video shows the Earth over the course of an entire year, and it’s mesmerizing. I suggest you listen to the narration while you watch, done by EPIC lead scientist Jay Herman. I love the bit about the solar eclipse (I wrote about that when it happened). Sadly, the video ends just before the Moon photobombed the Earth. 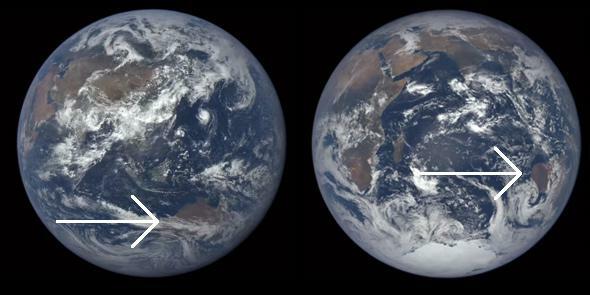 The view of DSCOVR in August (left) and December (right). Note the change in the position of Australia (arrowed) and Antarctica. The one on the left is from August 2015, and the one on the right from December 2015. See the difference? I put arrows pointing to Australia, and you can see that in December Australia is up “higher.” Note too you can see Antarctica clearly in December, but barely at all in August. What you’re seeing is literally a graphic demonstration of Earth’s seasons due to its tilt! If you watch the video again, you’ll see this. It starts in late July, during the Northern Hemisphere summer. At that time, the north pole is tipped toward the Sun (and therefore toward DSCOVR). You can see Greenland go by, and other northern features. But over the course of weeks and months, the North Pole tips away from the Sun and the South Pole tips toward it. Antarctica becomes visible. Then near the end of the video the North Pole comes into view again. The Earth’s axis stays fixed in space as it orbits the Sun. Mind you, the poles of the Earth aren’t really tipping at all; the axis of the Earth is pretty well fixed in space, and always points in the same direction. But over the course of the year the Earth goes around the Sun, and in the northern summer the pole is aimed “over” the Sun, dipped toward it, and six months later the North Pole is tipped away from the Sun. From DSCOVR’s (and the Sun’s) point of view, it looks like the Earth’s axis is moving, but it’s a matter of perspective. I suspect this video, combined with a good lesson plan, would work really well in the classroom to show how seasons work. If a student represents the Sun and another student, holding a globe, pretends to be the Earth in orbit, they could physically see how this works, too. A lot of people don’t really understand that it’s the Earth’s tilt that causes the seasons—I’ve explained it many times in talks, and it’s fun to see the look on someone’s face when they really figure it out. The beauty of this, too, is that this is one of the purposes of the DSCOVR mission: to help people better understand the Earth and our place in the cosmos. The fact that we are on a tilted, spinning, revolving planet affects our lives every single day. If more people understood that, I wonder how that too would affect our lives every day?